FIGURE 4-22 Model of the oxytocin receptor-mediated signal transduction pathway. This pathway should be similar in myometrium and mammary gland. Binding of OT (black triangle) to its receptor results in G-protein (a- and /3-y-subunits are indicated) and phosphoinositol-specific phospholipase C activation, causing IPs-mediated Ca2+ release from internal stores via an IP3 receptor (black). 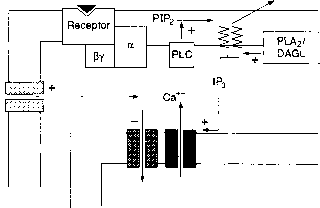 Additionally, calcium influx via plasma membrane calcium channels (shown in light gray) is enhanced, and sequestration of cytosolic calcium is inhibited through a blockade of the sarcolemmal (Mg2+-Ca2+)ATPase (gray). Diacylglycerol is thought to activate protein kinase C and is itself hydrolyzed by phospholipase A2 or diacylglycerol lipase to generate arachidonic acid, the substrate for prostaglandin synthesis: pip2, phosphatidylinositol bisphosphate; DAGL, diacylglycerol lipase; PLA2, phospholipase A2. out pregnancy. 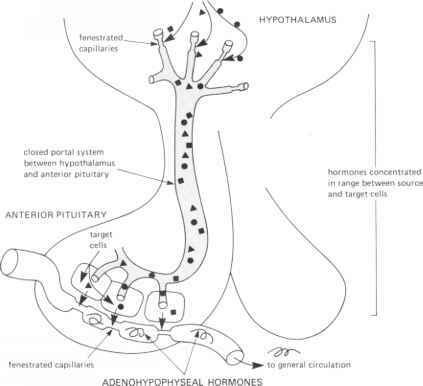 At the same time, estrogen causes the release of OT-NP from the posterior pituitary. The immature uterus is not stimulated to contract by OT. Experimentally, estrogen treatment in normal male subjects caused dramatic increases in estrogen-stimulated NP (for OT) plasma levels, but had no significant effect on nicotine-stimulated (for VP) NP secretion. The anatomy and morphology of the breast myoepithelial cells as the sites of action of OT are presented in Chapter 14. Released OT-NP complex dissociates in the blood, and free oxytocin binds to its receptor located on the membrane of the myoepithelial cell. OT regulates increased intracellular Ca2+ since it is required for derepression of the contractile system. Contraction occurs, the tubular lumen is narrowed by contraction, and milk is ejected (Figures 4-21 and 4-22). Some reports suggest that OT stimulates the release of PGF2a from the ovine endometrium in vitro and from the rat uterus. A direct effect of receptor-bound OT could lead to the regulation of membrane phospholipase to release arachidonic acid, the precursor of PGF2„. This prostaglandin seems to be produced by OT in the uterine myometrium as part of its effect on the initiation of labor. How PGF2a would act to promote contractions is unclear. Synthesis of estrogen is stimulated at the termination of pregnancy. This may increase the number of OT-binding sites in uterine myometrium at this time. It could also explain the sensitivity of the near-term uterus to OT coinciding with the burst of OT released from the posterior pituitary as the availability of free progesterone falls dramatically near term. As a result of OT action, the enhanced Ca2+ in cytosol is available to derepress the contractile mechanism to generate uterine contractions or contractions of mammary myoepithelial cells, as the case may be. The membrane human oxytocin receptor has been cloned and sequenced as shown in Figure 4-23. It is a member of the seven-membrane-spanning domain receptors. The OT receptor thus appears to be similar to the G-protein-coupled rhodopsin-type receptors and to the Vja and V2 vasopressin receptors. VP is not a ligand for the OT receptor, indicating that the cloned receptor is specific for oxytocin. Two enzymes are involved in the breakdown of OT and VP: cystine aminopeptidase and glutathione transhydrogenase (with oxidized glutathione reductase coupled as a reduced glutathione-regenerating system). The products of the reaction are shown in Figure 4-24. The degrading enzymes, GSH transhydrogenase and cystine aminopeptidase, can operate in random order as shown. There are also other pathways of degradation, principally in the brain or pituitary. The reactions pictured in Figure 4-24 take place in liver, other tissues, and blood, particularly during pregnancy.